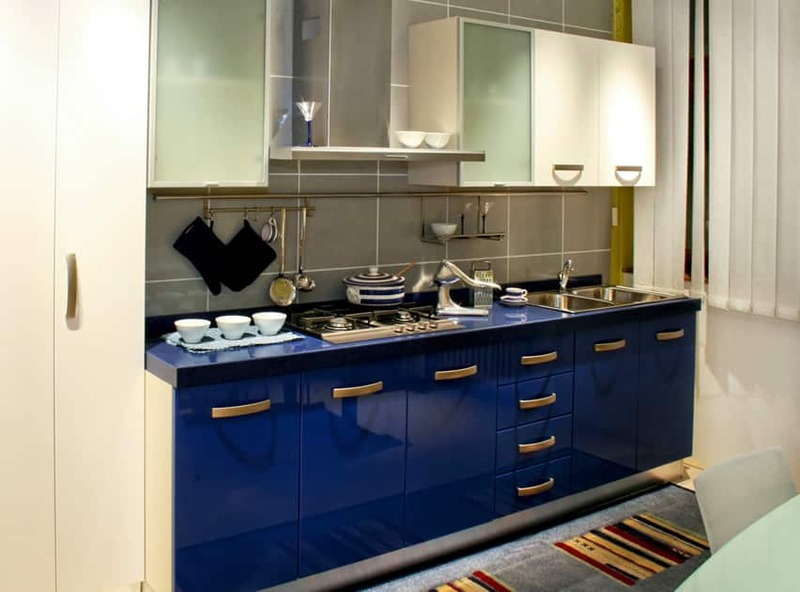 Welcome to our gallery of blue kitchen ideas. 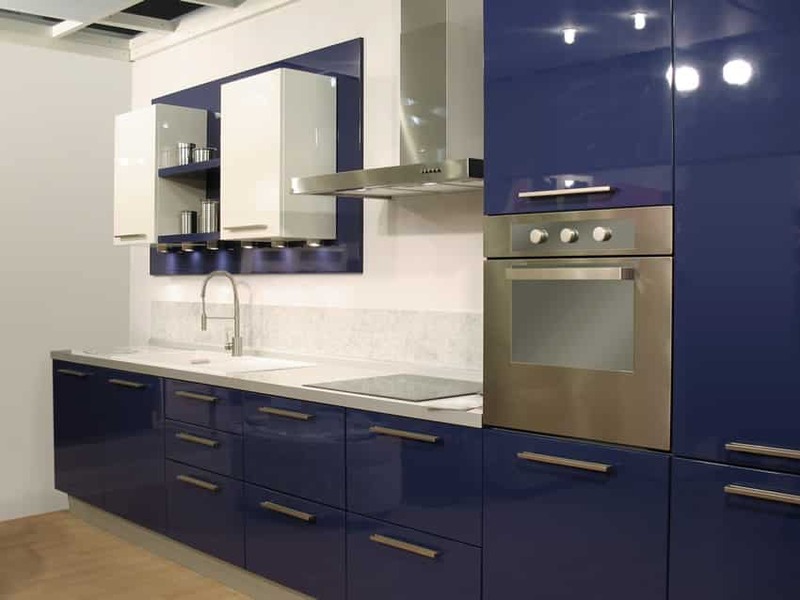 Introducing the color blue in to your kitchen design can make a big impression. Whether its by painting the cabinetry, or installing a back splash, blue will add a sense of calm and well-being to your space. From Teal, to turquoise, and navy to robin’s egg there are so many shades of blue to choose from its impossible to list them all. Whichever color you choose it’s sure to help give you a coastal or nautical look. 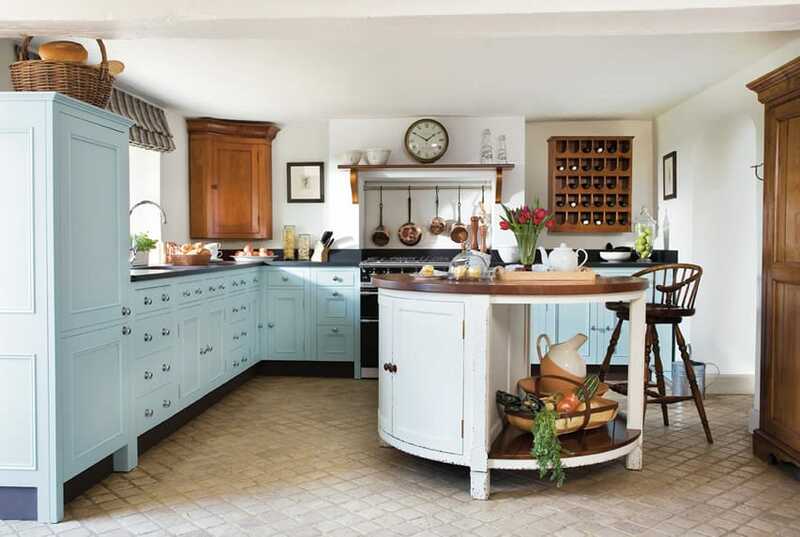 Blue also goes really well with a traditional country style kitchen and is a natural compliment for white hues. 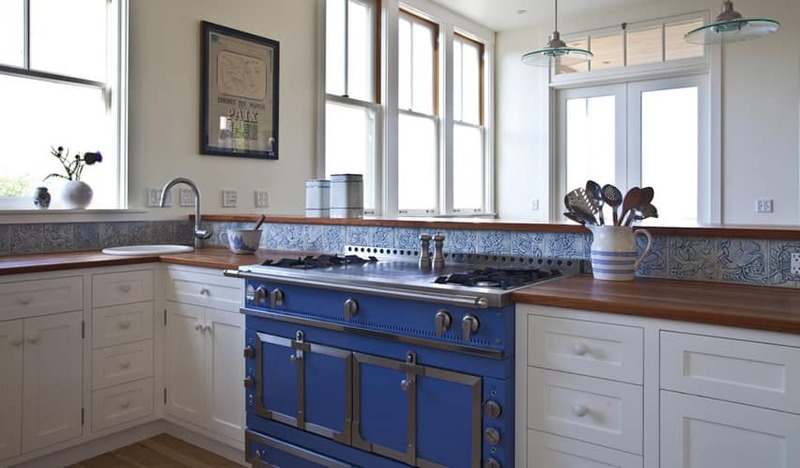 Here are some blue kitchen ideas to help you incorporate the color in your own design. This simple kitchen has a chic refreshing feel to it. Windows help illuminate the space, making it look brighter and more inviting. 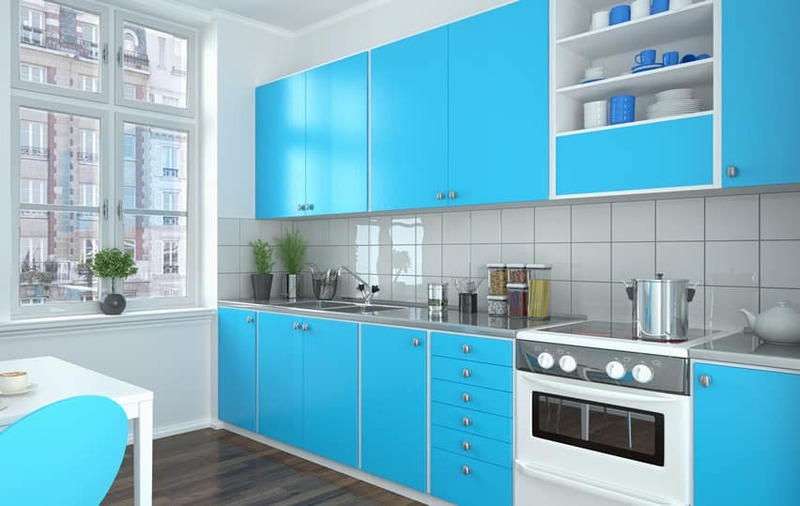 The powder blue kitchen cabinets is a refreshing update to traditional kitchen cabinets, and its combination with black counter top gives it a modern touch. You will see a unique movable kitchen island which is circular instead of typical square or rectangles, in antiqued white finish and wood block counter top. This kitchen doesn’t have much overhead counter space, but it does have one corner overhead cabinet, wine shelf and ledge in mahogany finish. 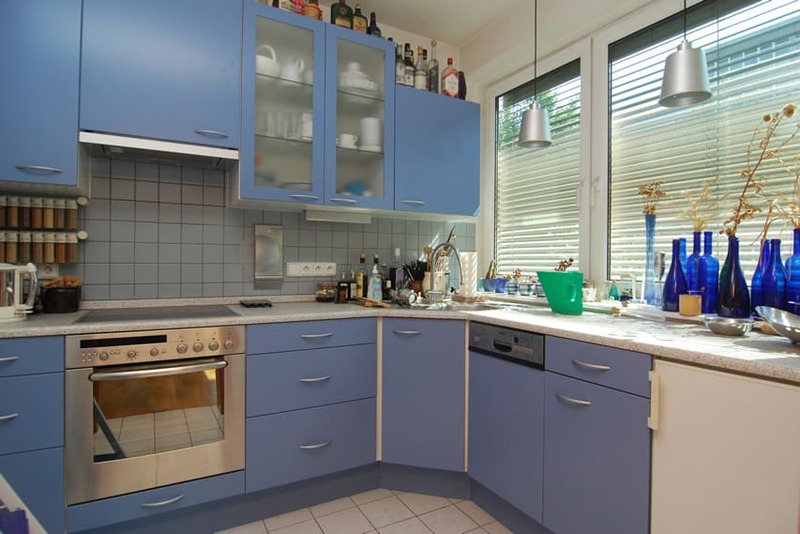 The use of a nice light blue color on the kitchen cabinets help update the look of this kitchen, as well as give it a young and vibrant appeal, without going overboard. The softness of the blue, combined with the light maple floors is pleasing to the eye and helps soften up the light gray walls. The countertop is a dark-stained wood block, adding a nice contrast and texture to the kitchen. 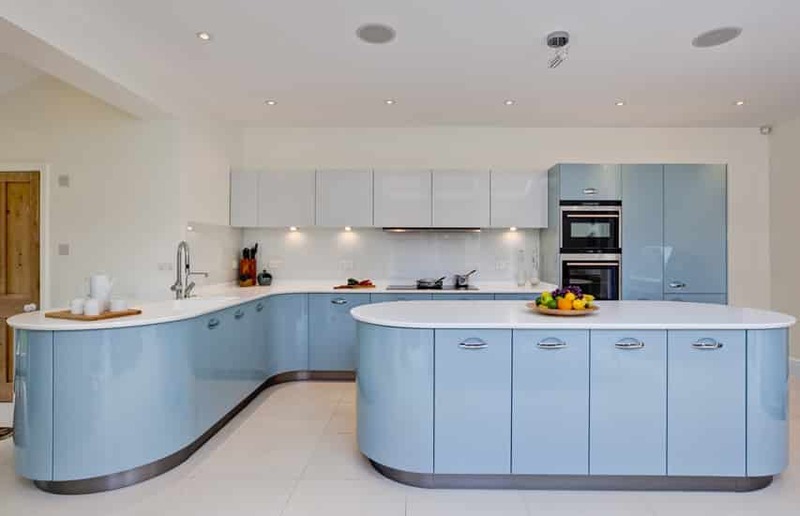 This attractive contemporary kitchen features blue cabinets matched with a gorgeous white carrara marble. The long breakfast bar island is also topped with the same white marble and is open to the rest of the home’s living area. Long rectangular white tiles are used as a backspace to help give this space a bright and refreshing backdrop. A very modern kitchen with a masculine and futuristic feel. 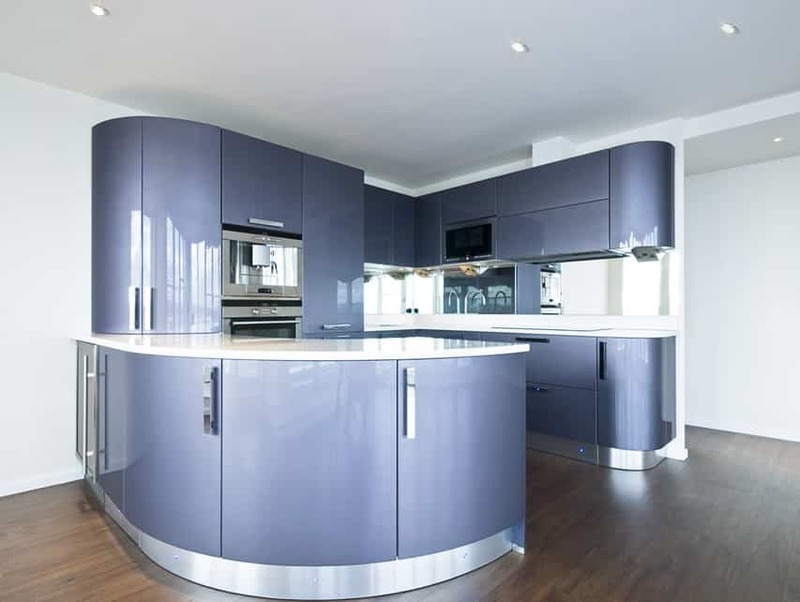 The kitchen cabinets are bent or curved, giving it a very modern feel. All kitchen cabinets are laminated in a sparkly blue color and topped with a gray solid surface counter, giving it that masculine look. Because the blue of the kitchen cabinets are bold enough, the rest of the space are kept low-key, using white walls and backsplash, as well as white floor tiles. This is a good example of how you can use bold colors in your kitchen space without making it too overwhelming. 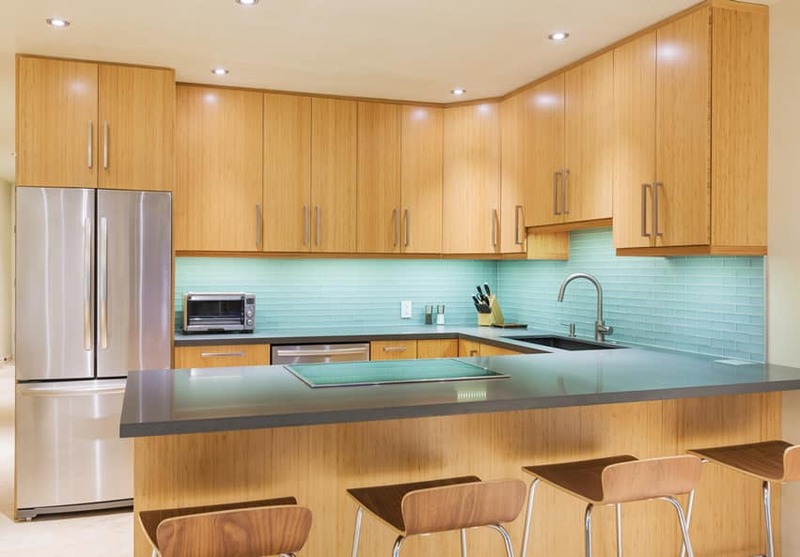 You can see that the teal-laminates are only used on the overhead cabinets and the oven wall/storage, while the base cabinets and the kitchen island uses a white maple wood laminate topped with brown solid surface counter top. Walls and floors are in white so as not to compete with the other colors and textures, while the back splash is white graphicote glass to give it that modern shine. Slate Blue color is a more neutral blue tone which can give an refreshing addition of color to you kitchen space, but still remains easy on the eyes and easy to pair with other different colors and finishes. You can see in this example that the cabinet drawers and doors are all laminated in a slate blue color, while the carcass is in white. For the counter top, a simple salt & pepper granite was used an combined with small gray ceramic tiles for the backsplash. Going for a more modern futuristic look and a masculine appeal, this kitchen kills edges and wonderfully curves it, creating an organic kitchen layout. 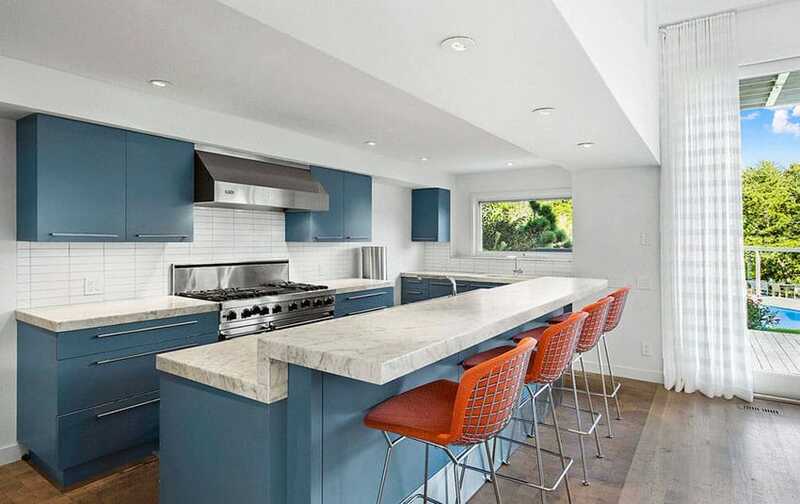 Instead of the dark blues and bright blues, this kitchen opted to use a gray-blue tone for its glossy kitchen laminates, combined with stainless steel laminated kick space and white solid surface countertop. 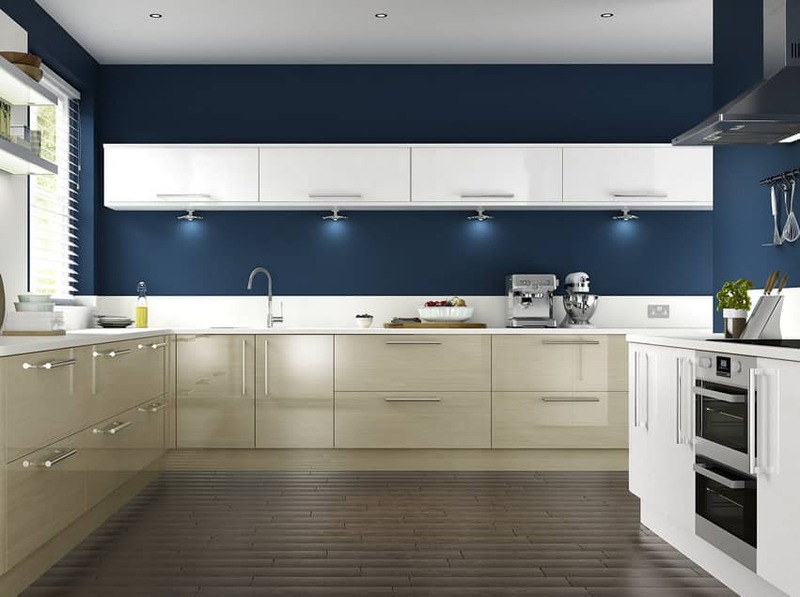 Vying away from bright blues, this kitchen used a more formal and sleek shade of blue. The Dark Navy Blue mirror finish laminates gives this kitchen a masculine modern appeal, and is just as easy on the eyes as usual neutral and monochrome colors. It’s a simple gallery kitchen with minimalist modular cabinets. simple white with gray specks solid surface countertop and backasplash and brushed stainless steel pulls and appliances. 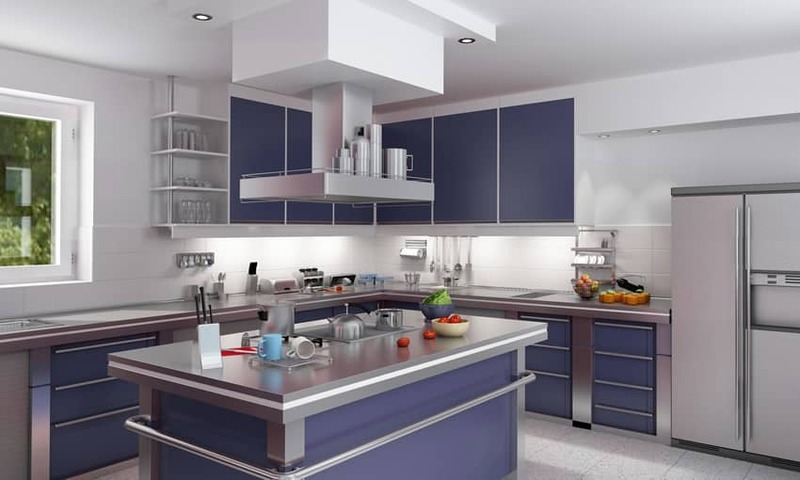 In order to achieve this kitchen look, you first must ensure that most of the other surfaces of the kitchen have neutral tones which will not compete against the vibrancy of the kitchen cabinets. 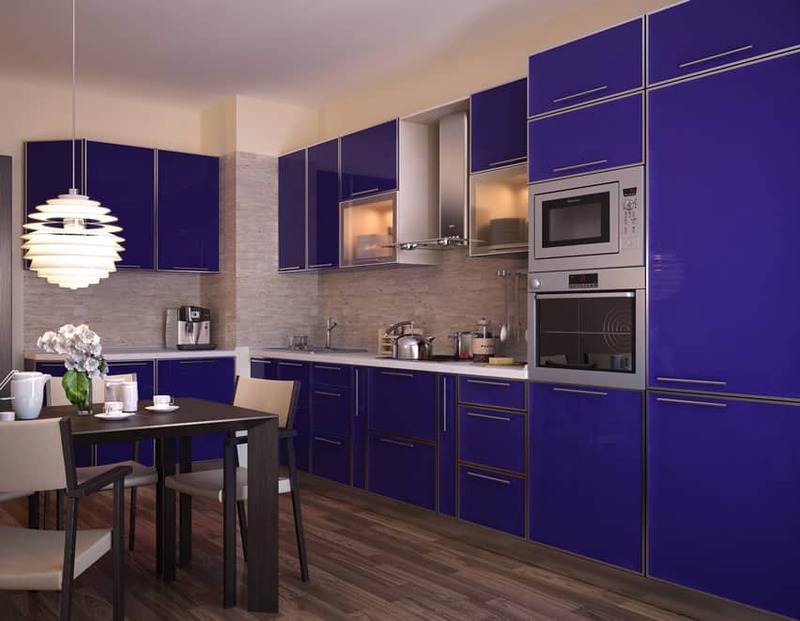 The kitchen cabinets are metal-framed graphicote glass in a vibrant blue-violet color, creating a very bold and loud kitchen design. The rest of the elements are kept low-key to balance the look. 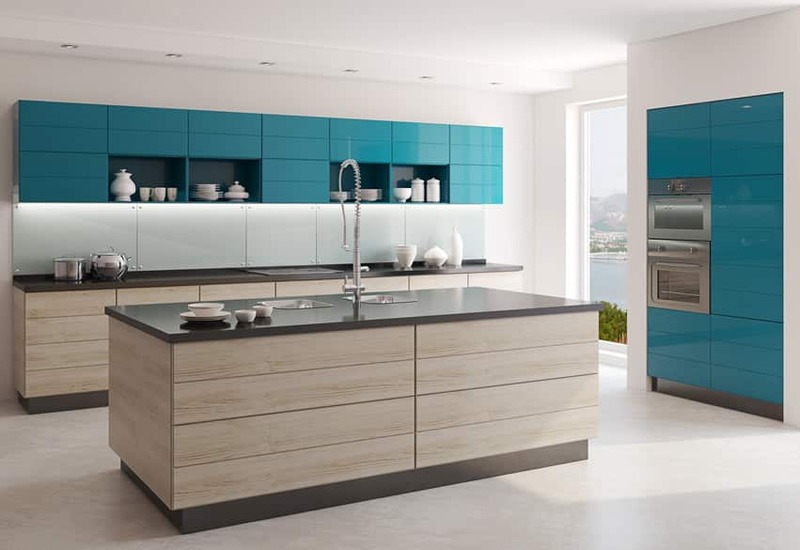 The soft powder blue color used on the kitchen cabinet laminates gives a soft and refreshing feel to the space. 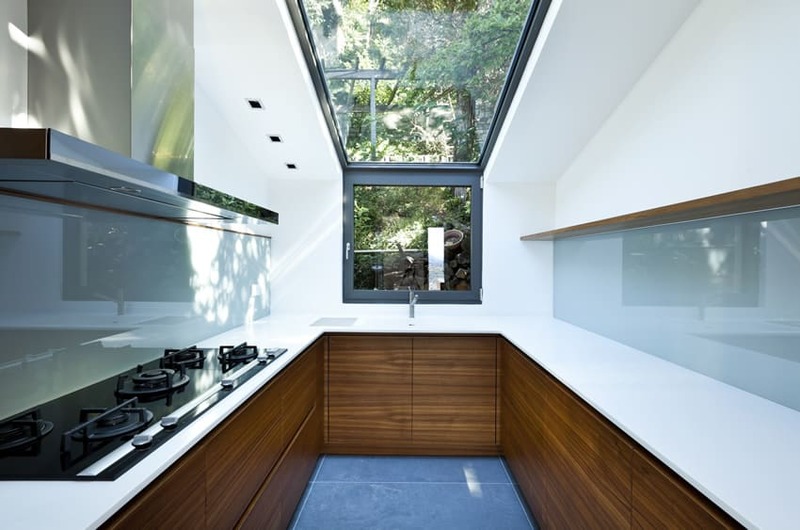 You will also notice that this kitchen has no corners – corners are curved, creating a very modern look. The upper cabinets are laminated in white instead of powder blue of the base and the pantry cabinets, counter top is white solid surface and the backsplash material is white graphicote. 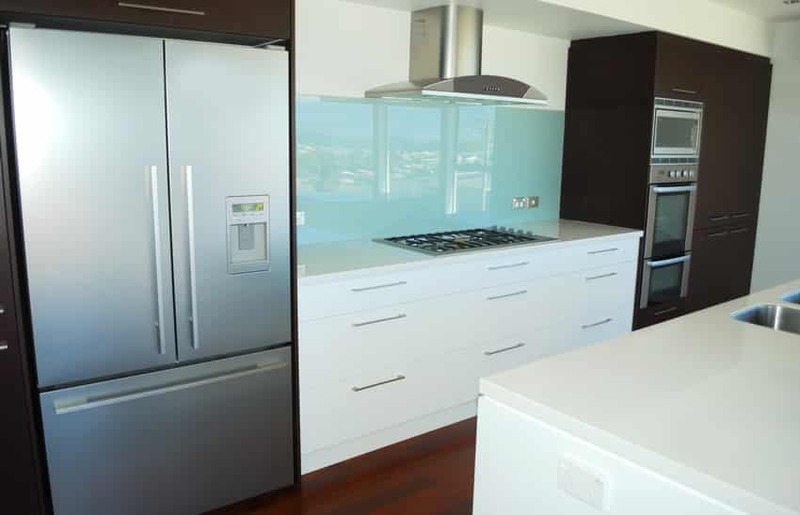 Overall, this kitchen manages to create a modern kitchen, with a soft and youthful vibe. 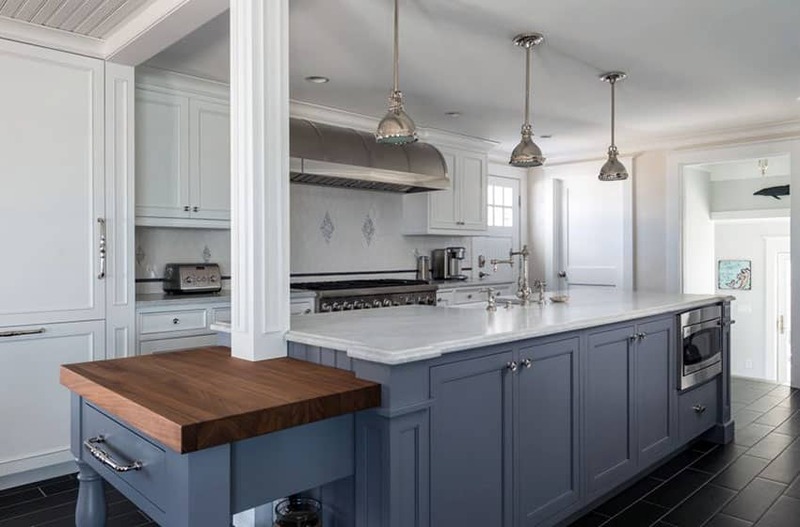 A beautiful kitchen with white cabinetry that is contrasted against a dark blue painted island topped with satin white marble and a small butcher block. The bright white of the cabinetry and countertops looks elegant next to the dark ceramic tile floor and blue island. This is a really nice simple classic kitchen with white flush-door kitchen cabinets and drawers, white pulls and Walnut woodblock counter top. The small space between the bar counter and the main counter surface has embossed tiles in a light blue color, and the rest of the blue is seen on the range cooked with blue body and staineless steel top. This modern uses stainless steel base carcass all the way to its countertop surface, except for its kitchen island which has gray stone top. The cabinet and drawer doors are laminated in a nice slate blue color, which adds a nice subtle touch of color to the kitchen space. There is also integrated under cabinet lighting and open shelves to combine with the overhead cabinets. The almost gray tone of slate blue is perfect if you want to create a masculine modern kitchen design, without using blacks or gray normally used in modern kitchens. This gives a slightly cool tone to your kitchen, making it look more youthful and refreshing. 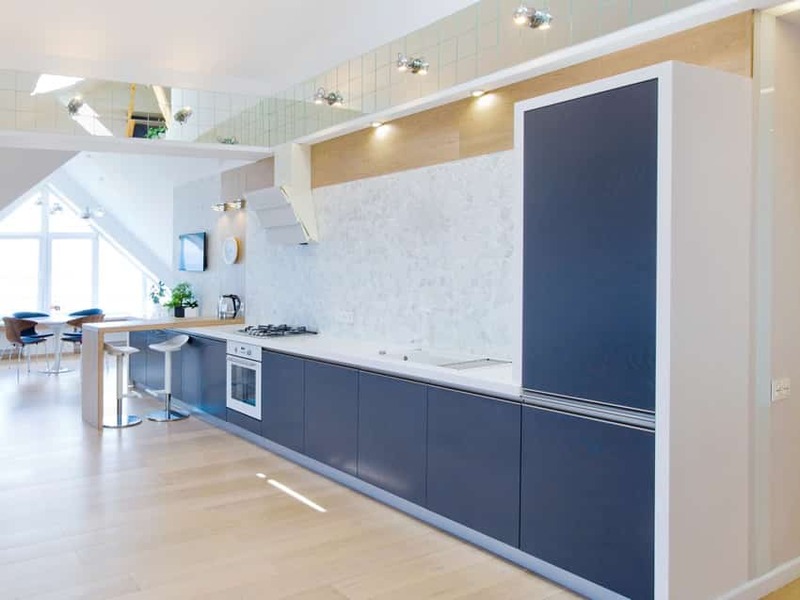 In this example, slate blue, white and Maple wood tones harmoniously combine to create a simple modern kitchen look which will leave a great impression on both guests and its users. A simple modern kitchen set up which looks bigger that it really is thanks to the mirror backsplash which helps give a visual illusion of more space. The kitchen cabinets are laminated in a dark slate blue color, making it look almost gray and giving it a masculine appeal. Keeping to the modern look, the countertop is white solid surface and it integrates under cabinet lighting as well. 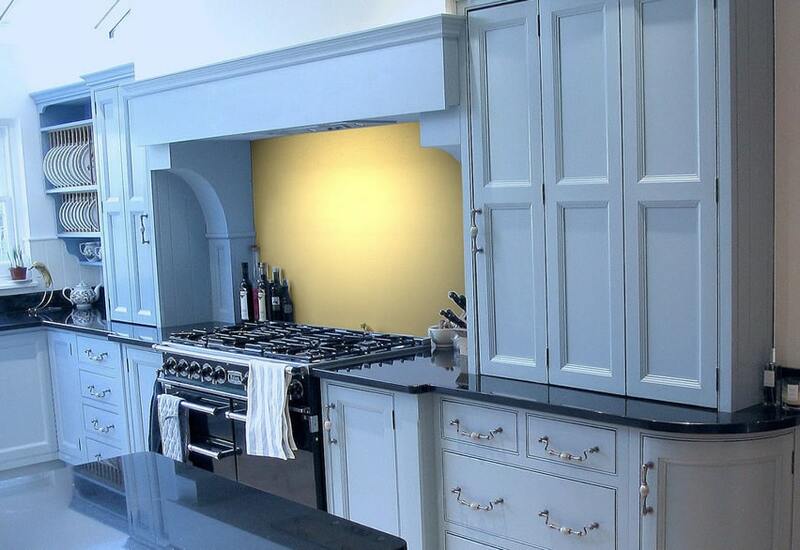 This small kitchen combines dark blue laminated base cabinets with white carcass and upper cabinets. The light gray backsplash tiles serves as a good neutral surface to balance the colors,and the blue quartztite countertop is a good matching to the blue cabinets. The neutral surfaces of this kitchen make it easy to use bright colors for its kitchen cabinets. 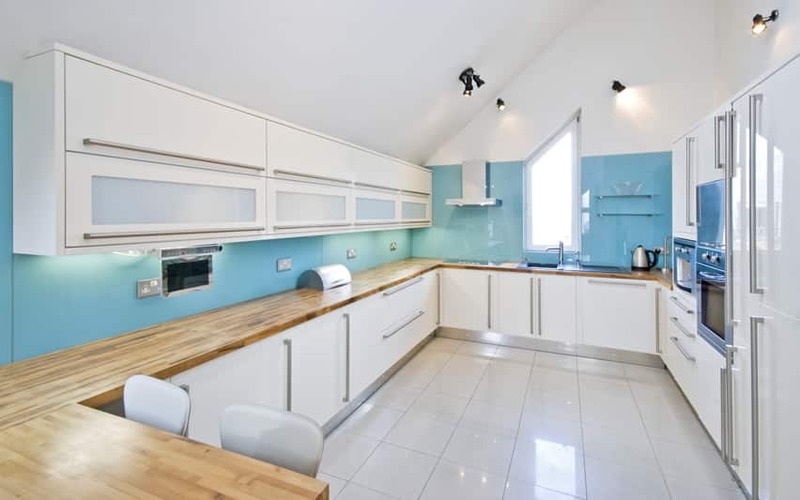 This bright turquoise color surely gives a youthful, fun and refreshing appeal to this kitchen space, creating a bright mood. The white walls, square tile backsplash and cabinet carcass helps tone down the vibrancy of the blue and balances the whole look. This is a classic kitchen design with paneled kitchen cabinet doors painted in a white shade with a tinge of blue, givin the whole kitchen a very subtle blue hue. The countertop material is black granite, and you will also see a yellow-painted backsplash which is a nice complementary color for blue. 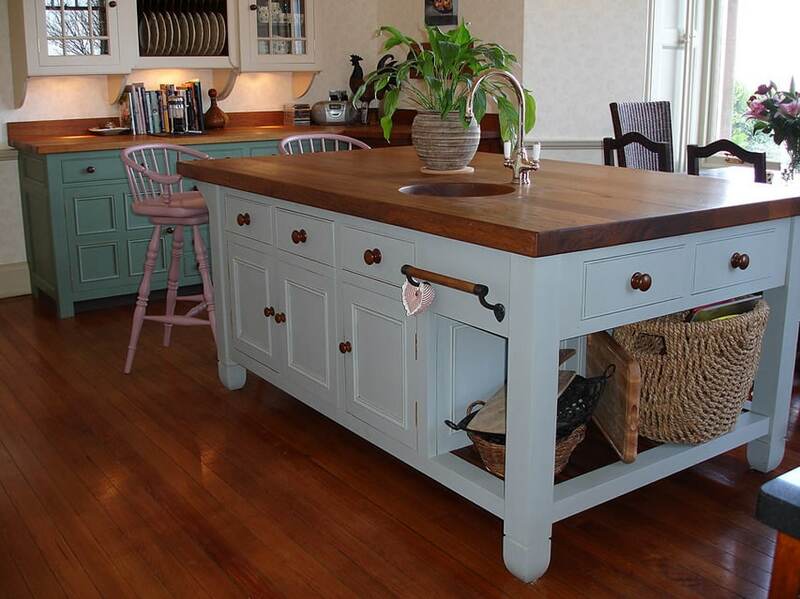 You can come up with many blue kitchen ideas just by deciding what color to paint your island. This traditional kitchen looks great with its blue painted island with white quartz countertop and matching white cabinetry. Painting your island blue is great way to a coastal design vibe in your kitchen and offer some contrast to your base cabinets. A kitchen with a very shabby chic country appeal, its small kitchen has a thick block of walnut for all its countertop, which is combined with classic base cabinets. 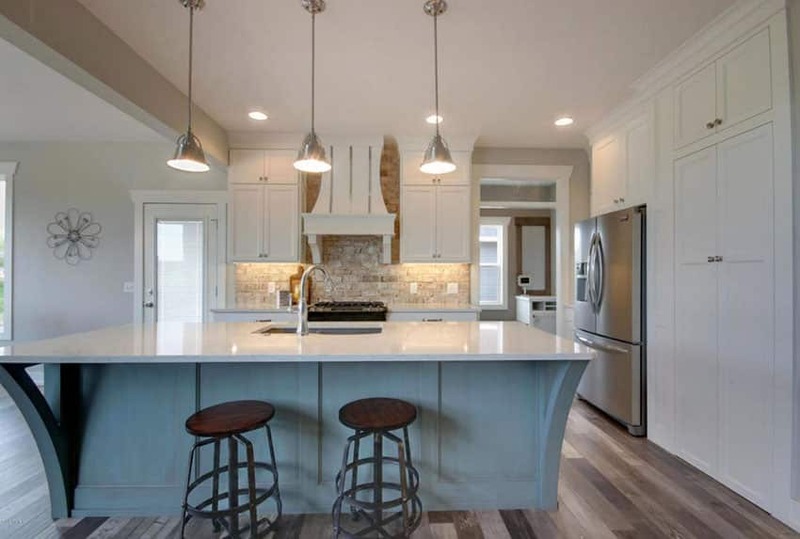 The kitchen island has baby blue base cabinets, and the main counter area has emerald colored base cabinet and white overhead cabinet, creating a subtle and pleasing color combination. Bold colors makes a very loud statement, so you don’t need to use it in large volumes. 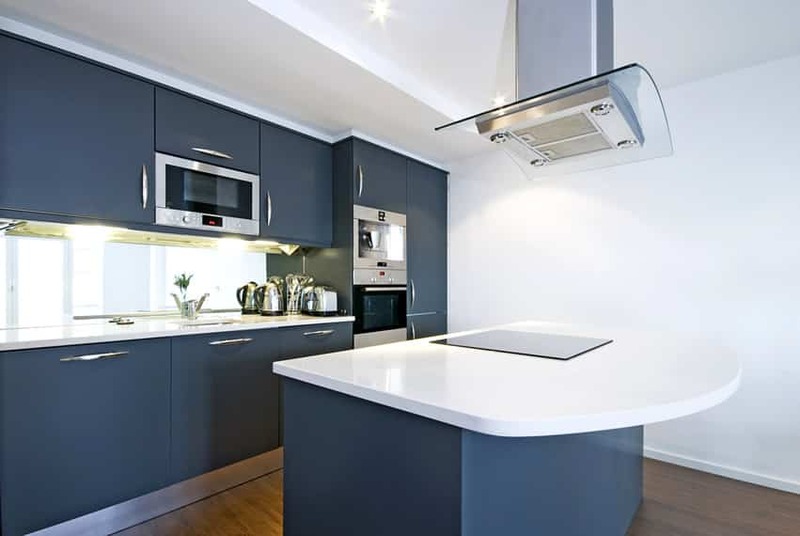 In this example, you will see that the kitchen is main black. Counter top is black granite, with matte black laminated cabinet and black leather upholstered bar stools. 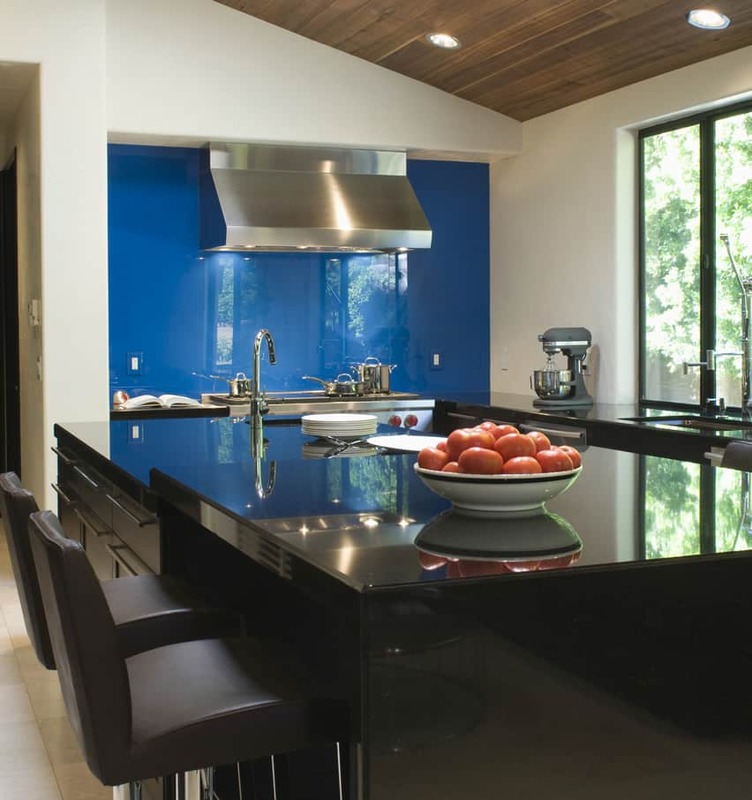 The wall behind the range cook top, however, uses cobalt blue graphicote glass, adding a very bold pop of color to the space. You don’t need to replace your current kitchen cabinets with blue-laminated doors to add that refreshing pop of blue to your space, like in this example, you will see how the kitchen has used wood laminated base cabinets and white laminated overhead cabinets. The sky blue color was applied on the graphicote glass backsplash, giving it a subtle and refreshing pop of color. While in most other kitchens, the blue is applied on the walls of the cabinets, for this kitchen design, it is applied on the floor, giving a very subtle pop of blue to the small kitchen space. The rest of the kitchen is simple and modern, with wood laminated kitchen cabinets and plain white solid surface counter top. The subtle blue on the floors complements the greens visible from the windows in the kitchen, and helps give a more natural feel to the kitchen space. 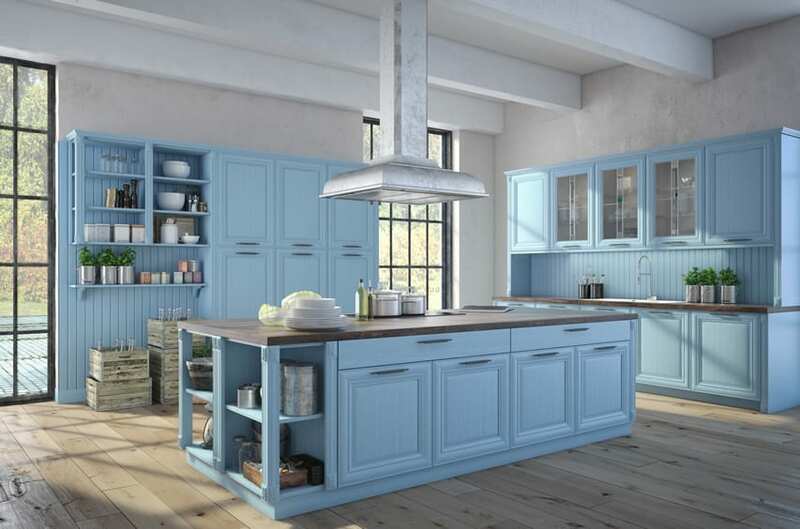 This is an excellent example of subtly adding blue into your kitchen without having to change your wood-stained or laminated cabinets. 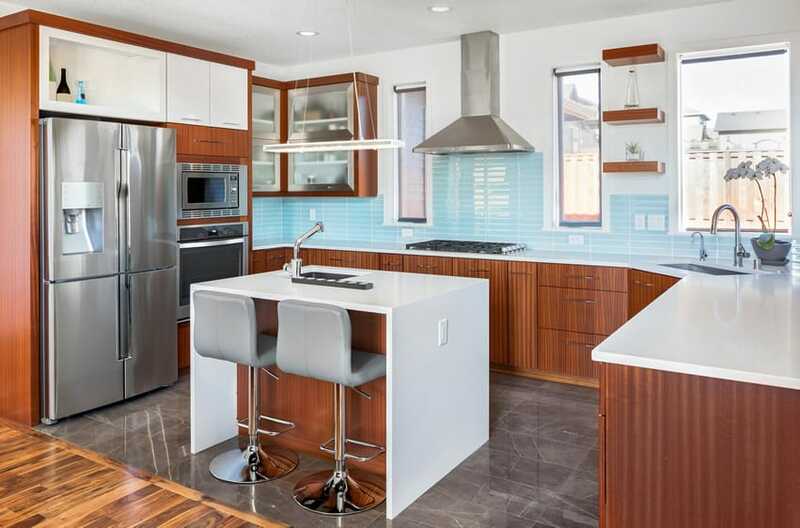 By keep classic wood cabinets and just adding the blue as accents, in this case, turquoise glass backsplash tiles, you are given the freedom to change it later on if you want another color, without having to tear down the whole kitchen. This is another simple and modern kitchen which uses blue in a very subtle way to add a refreshing splash of color into the space. The main cabinets are all laminated in white with matching white solid surface counter top, while the taller full-height cabinets are laminated in a wengue color. The blue can be seen applied on the backasplash, which is a graphicote glass. The kitchen cabinets are fully laminated in a gorgeous Maple Laminate, giving the space a warm and homey appeal despite its modern look. For the countertop, it opted to use a gray solid surface in favor of white solid surface to add a contrasting color into the space. The blue is again added subtly in this kitchen design, which can be found on the glass subway tiles used on the backsplash which has a nice light turquoise color. Going for a bolder approach in applying blue, this kitchen uses dark navy blue paint all over its walls. Despite the dark and bold wall color choice, it still has a balanced over-all appeal thanks to its use of a combination of light beige and white cabinets and white solid surface countertop and backsplash. 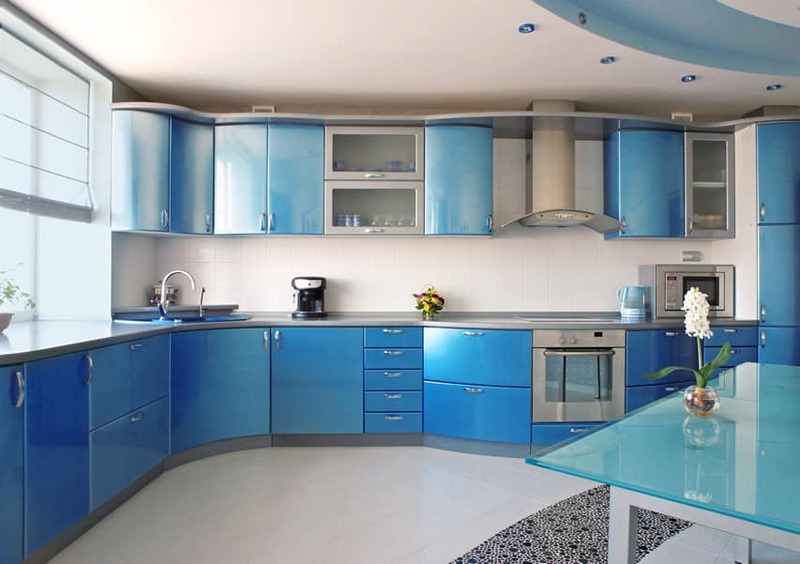 There are many blue kitchen ideas one can implement to bring the color into your space. Blue glass backsplash makes a big impression in this modern full-sized kitchen with a bright and refreshing color scheme. All cabinets are laminated in white, uses brushed stainless steel handles and kickspace, and topped with woodblock counter top running throughout the kitchen. 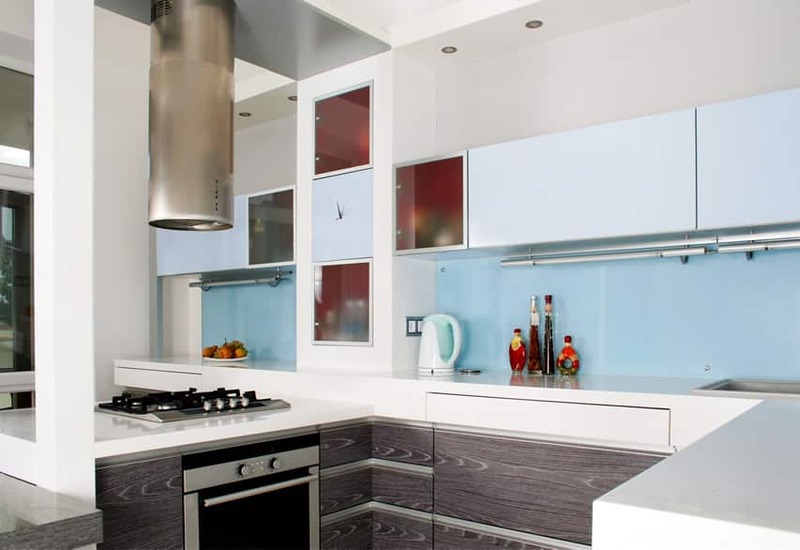 The backasplash is graphicote glass in a nice shade of sky blue, giving the space a refreshing youthful look.